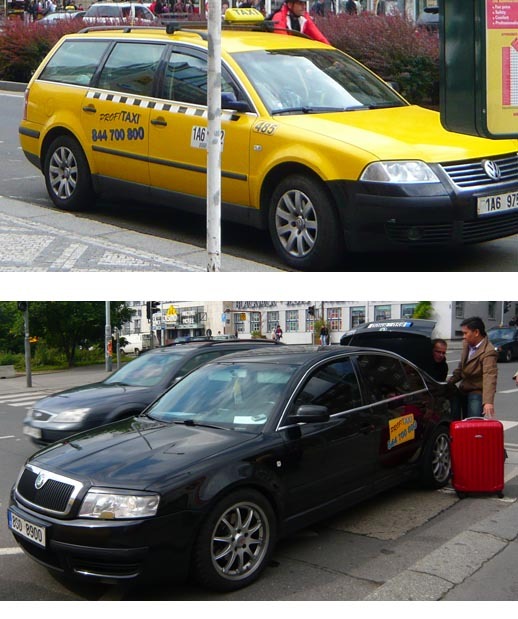 How to use Prague Taxi without being ripped off? 3. If you really need to hail a taxi in the touristy areas, look out for this Fair Place Taxi sign. Prague municipal authorities want to guarantee that if you take a taxi on places marked with a sign “FAIR PLACE” and a thumbs-up image you will get a fair price and the journey will be safe. 4. The official rate for licensed cabs is 40Kc flag fall plus 28 Kc per kilometre and 6 Kc per minute while waiting. If you know the address of your destination and alighting point, check out the approximate cost on the AAA Radio Taxi website. There were claims that some unscrupulous taxi driver manipulated their meter to make it run faster so keep an eye on the meter for any abnormal behavior. 5. Always ask for a receipt before you alight. That way, if you have a nagging doubt that you might have been ripped off, you can complain to the Prague City Council. However, I am not quite sure if that will help you get your fare back, but at least you get rid of one errant driver. Make sure that the receipt contains personal details of the driver. If the driver refuses to give you the receipt, make sure you know the registration number and the number on the door. Such a great article you’ll able to share your own experienced and let others know what are the do’s and dont’s. If any chance we can visit Prague this sure really comes in handy. Great travel tips i admit. .-= Best Tourist Destination´s last blog ..Luxor: Home of Finest Egyptian Styles =-. You can also use ATP Airport Transfer Prague company. They use luxury, comfortable and nomarked cars. English speaking drivers, low fixed price. Thanks for the tips; this will come in handy when I visit later this year. thanks for the article, but looks little bit “tendency”, doesn´t? It is not true most yellow cab driver speaks english. I would bet on 50%. The problem of AAA is similar to every big company, it is hard to keep the quality of drivers. I know few guys from the airport and I know their driving abilities. Sometimes they are in “rush” to get back to the hill (airport) ASAP and some of my clients were not very happy with them. OK, well, it is not bad solution. When booking, just ask for english speaking chaffeur. If there is time, book with transfer companies, like the one mentioned above (ATP Airport Transfer Prague – I used to work for them, they are not bad guys) and they usualy will be cheaper than average taxi. The advantage is that they mostly work with foreigners and they do speak english. What is a big plus, especialy in the rush hours, you do not need to be stressed by any meter, there is no waiting charge, there is no mileage. One more guaranty you will travel the most effective way. Last advice – if there is anyway a moment you must jump into firs cab on horizon, never show you are in a hurry and allways agree the price in advance. Let the guy know you are not a stupid one (tourist) and explain there is a limit in your budget and you will not pay a crown (CZK) above it.